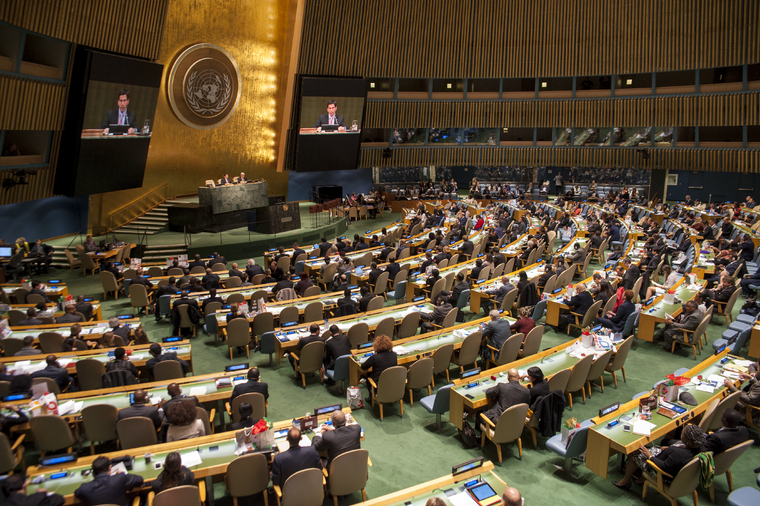 28 October 2015 – The General Assembly today elected 18 States to serve on the United Nations Human Rights Council for three-year terms beginning on 1 January 2016. Those elected were Belgium, Burundi, Côte d'Ivoire, Ecuador, Ethiopia, Georgia, Germany, Kenya, Kyrgyzstan, Mongolia, Panama, Philippines, Republic of Korea, Slovenia, Switzerland, Togo, United Arab Emirates and Venezuela. The 18 outgoing members were Argentina, Brazil, Côte d'Ivoire, Estonia, Ethiopia, Gabon, Germany, Ireland, Japan, Kazakhstan, Kenya, Montenegro, Pakistan, Republic of Korea, Sierra Leone, United Arab Emirates, United States and Venezuela. In accordance with Assembly resolution 60/251, those Member States were eligible for immediate re-election except the delegation which had served two consecutive terms, namely, the United States. The distribution of seats for the current election was as follows: five seats for African States, five seats for Asia-Pacific States, two seats for Eastern European States, three seats for Latin American and Caribbean States and three seats for Western European and other States. Of those elected, Burundi, Georgia, Togo, Mongolia and Panama will be sitting on the Geneva-based body for the first time. Re-elected for an additional term was Côte d'Ivoire, Ethiopia, Germany, Kenya, Republic of Korea, United Arab Emirates and Venezuela. The following States will also continue as members of the Human Rights Council: Albania, Algeria, Bangladesh, Bolivia, Botswana, China, Congo, Cuba, El Salvador, France, Ghana, India, Indonesia, Latvia, Maldives, Mexico, Morocco, Namibia, Netherlands, Nigeria, Paraguay, Portugal, Qatar, Russian Federation, Saudi Arabia, South Africa, the Former Yugoslav Republic of Macedonia, United Kingdom and Viet Nam. Beginning in 2013, the Human Rights Council is expected to start its yearly membership cycle on 1 January. As a transitional measure, the period of office of its members ending in June 2015 has been exceptionally extended until the end of the calendar year. Created by the Assembly in 2006, the 47-member Council is an inter-governmental body within the UN system responsible for strengthening the promotion and protection of human rights around the globe and for addressing situations of human rights violations and making recommendations on them. All of its members are elected by the world body's General Assembly, and it has the ability to discuss all thematic human rights issues and situations that require its attention throughout the year. It meets at the UN Office at Geneva.